A poster advertising the launch of Greening the Rubble's Green Room on Colombo Street. 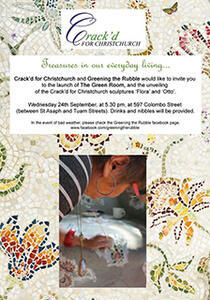 The poster also advertises the unveiling of Crack'd for Christchurch's armchair and ottoman artworks. 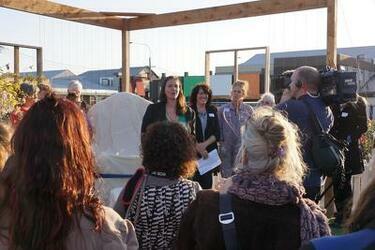 A photograph of the steel frame of Crack'd for Christchurch's armchair artwork. The frame is on a pallet in the Greening the Rubble workshop. Two cast-iron bath feet have been attached to the front legs. 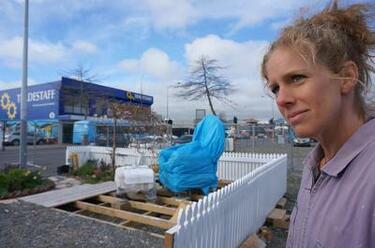 Crack'd for Christchurch comments, "Mid September 2013. 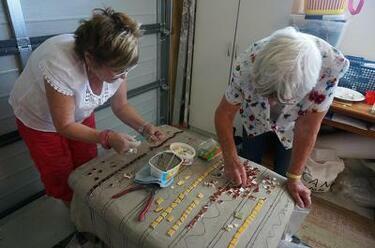 The chair frame was made by Bob Hamilton from Total Fabrications." A copy of the information board displayed at Greening the Rubble's Green Room on Colombo Street. 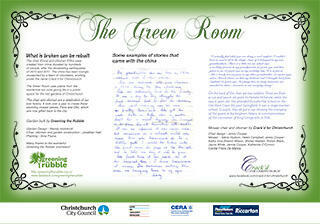 The board contains information about the Green Room and Crack'd for Christchurch's armchair and ottoman artworks. Crack'd for Christchurch comments, "Coming up with colour combinations. This is the fun part." 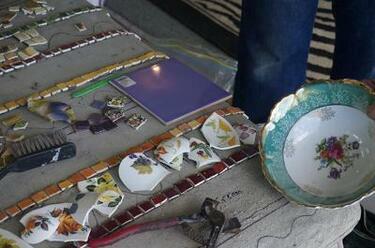 A photograph of pieces of broken china laid on top of Crack'd for Christchurch's ottoman. 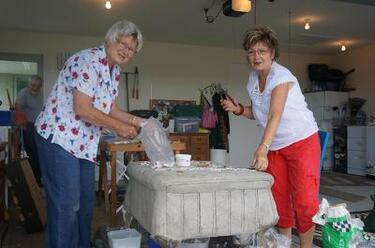 Crack'd for Christchurch comments, "A mosaicking day over the summer...lots of laughter and good food too." 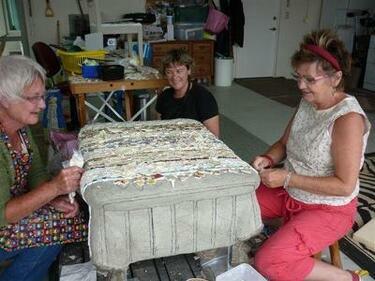 A photograph of members of Crack'd for Christchurch working on their ottoman mosaic. The team have drawn guidelines on the top and sides of the ottoman and are beginning to lay pieces of broken china on top. Crack'd for Christchurch comments, "Otto was mosaicked in Helen Campbell's garage during the summer of 2013 - 2014. 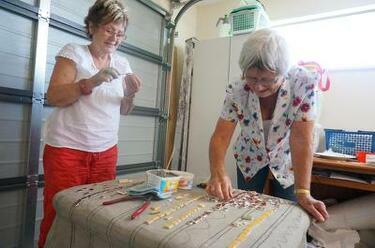 From left: Helen Campbell and Sharon Wilson. Helen's long-suffering husband Alan is also in the background." 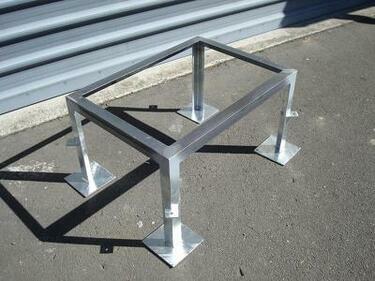 A photograph of the steel frame of Crack'd for Christchurch's ottoman artwork. 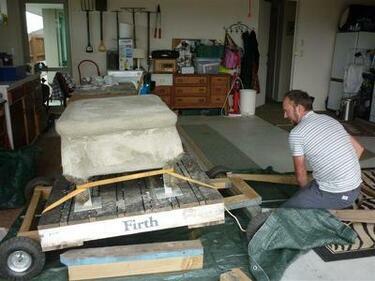 Crack'd for Christchurch comments, "Mid September 2013. 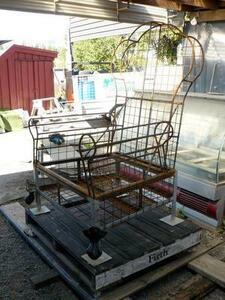 The ottoman frame was made by Bob Hamilton from Total Fabrications." 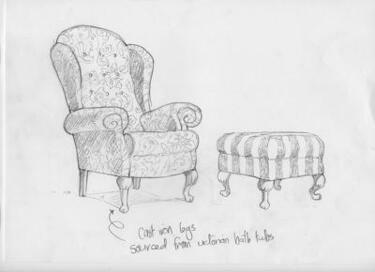 A digital copy of a concept drawing of Crack'd for Christchurch's armchair and ottoman artworks. The drawing is of an armchair and an ottoman. A written note near the bottom of the drawing reads, "Cast iron legs sources from Victorian bath tubs". 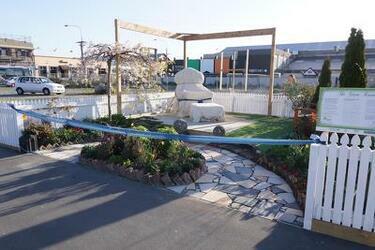 A photograph of the completed Green Room garden on Colombo Street. 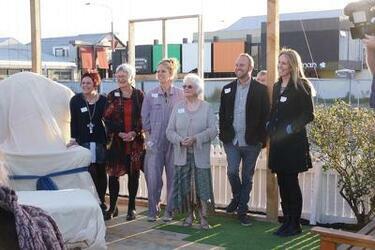 Crack'd for Christchurch's armchair and mosaic artworks are on a platform in the back. 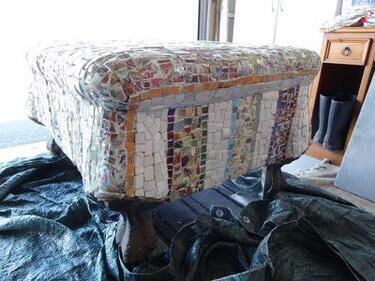 The armchair and ottoman have been wrapped in calico and secured with a bow. A blue ribbon has been tied across the entrance of the garden. A photograph of Marie Hudson standing in front of the Green Room garden on Colombo Street. 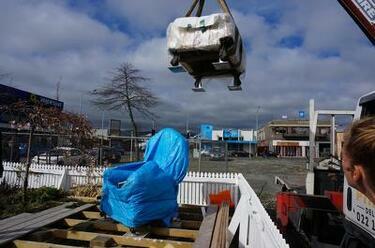 In the background, Crack'd for Christchurch's armchair and ottoman artwork have been placed on a platform to await their unveiling. 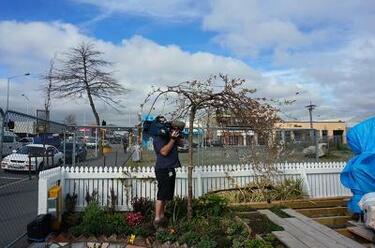 A photograph of Marie Hudson and Jonathan Hall helping to direct Crack'd for Christchurch's ottoman artwork as it is lowered onto a platform in the Green Room garden on Colombo Street. 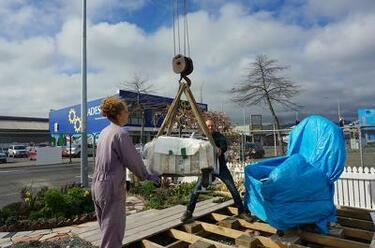 A photograph of Crack'd for Christchurch's ottoman artwork being lowered onto a platform in the Green Room garden on Colombo Street. 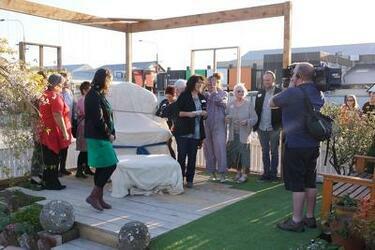 A photograph of the members of Crack'd for Christchurch during the launch of the Green Room garden. The members have gathered next to their armchair and ottoman artwork in the garden. The armchair and ottoman are covered in white sheets and tied with a blue bow. They will be unveiled for the first time during the launch.